Removed all sub styles since they don't work...Back to the original blue in a small package. -Package now includes 5 colour themes!!! note: simmering black now looks like vista! haha...but I did not use any vista based skin to make it. note: default blue is the original colour of this skin. The other colours are just for fun, in case you feel like having a change. note: I don't have the paid version of skin studio so I did all the new colour themes manually!! hard work!! sure hope you like it!! -Minor changes to the default blue skin. The transparency on the log off and shut down dialogs before didn't work and appeared in magic pink so now they are all solid opaque. -The 3 buttons on the window [minimize, maximize and close] now when clicked on, the shape itself darkens, not a big square around the shape. -olive green -- same style as the default blue except different colour. note: Did all the changes manually since I do not have the paid version of skinstudio! Well, I may be adding more colour themes in future! My third skin. Well, this skin is for those who still like the default xp skin but are getting a little bored with it. 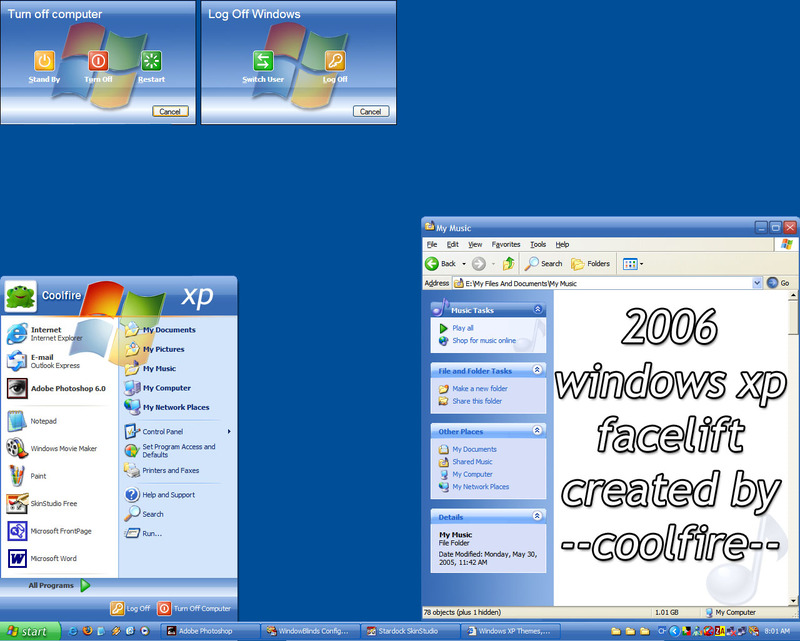 This version features the newest reflective-like designs on the taskbar and title bars, but keeping the familiar colours of blue and green on the default xp skin. Task menu feature the new reflective style too. The shut down and log off screen features a total revamped design, now metallic and reflextive blue at the same time with a windows flag watermarked behind. Overall I think it's my best skin so far..hope everyone likes it!! Wow, a great everyday skin that is easy on the eyes. GREAT job. Am using it now and so is my wife!!! Thats pretty neat. It would freak some people out wondering how you got the (normal) windows to look that way. Cool idea. No offense here , but this skin looks like a slightly modified version of Royale by Microsoft with very little changes to make it different. thanks for the comments......what is Royale by Microsoft? I never heard of it......I didn't use any Royale by Microsoft when creating this skin...........hmmm?? Hahaha!!! Weird. This looks nice but it looks way to much like Windows Media Center. It would have been nice if you would have also changed the icons in Internet Explorer and else where like many other skins. I think if this were done it would have seperated this more from Microsoft's Window Media Center. i think the windows media centre is the same as the royale skin as mentioned above......... anyway, now i've added more colour themes in!! 5 choices now! none of the colors work on my computer. they don't show up in WindowBlinds. just green and blue. I really like all the colors.....Good job. Well done but I bought windowblinds to have functional original skins. The MS Luna theme is a lot better than some of these comments imply. Do you truly think the typical original skin is better than Luna? To my taste, the problem with this skin is that it falls short of Luna in one very important way: Luna provides consistent and appropriate color in the toolbar area for Office 2003 applications. The skinning pertaining to the toolbars is more important than the title bar, because: 1) You look at it a lot more; and 2) It seems much harder to do right. The master of that craft is Essorant.